Opossums have an extremely varied diet. They are omnivores and will eat a wide variety of different animals as well as various types of plants, depending on what is available to them. Opossums will eat all types of vegetables, fruits and berries. Grasses and leaves have also been found in the digestive systems of these mammals. The types of flesh that they will consume are equally varied. It includes all types of insects, worms, snails, amphibians, birds, mice, rats and reptiles. In fact, opossums are known to eat rattlesnakes and are immune to their venom. They will eat animals that are already dead as well. Opossums are opportunistic eaters and will take advantage of whatever food source, plant or animal, comes their way. They will sometimes get into garbage but are more often seen eating out of a pet's food dish. The National Opossum Society warns of the inadequacy of suggested diets in caring for opossums. If you should find an opossum that needs care, it's best to contact a veterinarian or a wildlife rehabilitation center to ensure that the animal gets the nutrition it needs. 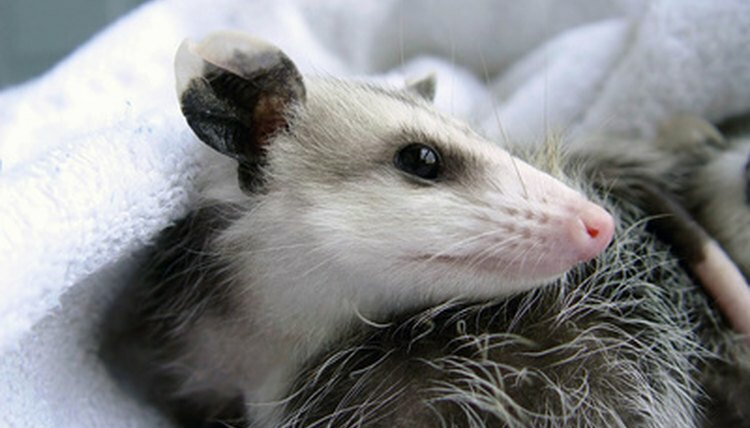 If you have one as a pet, realize that simply because an opossum is on the label, does not mean the food is properly balanced for these animals. Maureen Santucci has been writing since 1989 in a variety of professions, including television syndication, where her bylines appeared in "TV Guide." Recent writings have been more focused on business and medicine and have appeared in various online publications. She has a bachelor's in history from UMass, a master's in business from UCLA and a master's in Oriental medicine from Emperor's College.